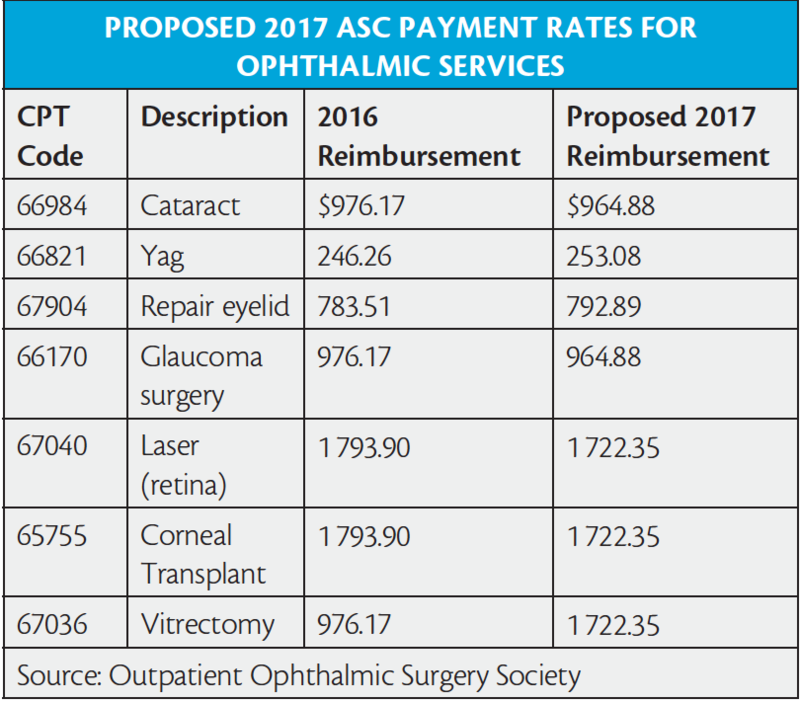 The Centers for Medicare and Medicaid Services (CMS) issued the proposed 2017 payment rate regulation for hospital outpatient departments and ambulatory surgery centers (ASCs), according to the ophthalmic advocacy group Outpatient Ophthalmic Surgery Society (OOSS). The payment schedule includes nearly $750 increased reimbursement for vitrectomy. After adjusting for operating costs, the OOSS estimates that ASCs will see a positive payment rate of 1.2%. The OOSS evaluated the proposed 2017 schedule and provided a chart similar to the table to the right. 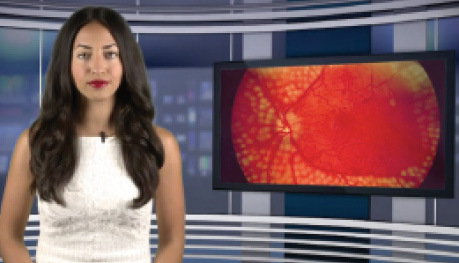 EyewireTV reported that the proposed CMS physician payment rule includes Medicare reimbursement for the Argus II Retinal Prosthesis System (Second Sight). The proposed CMS price for Argus II implantation is $150 000; the rate in 2016 was $95 000. The US Food and Drug Administration (FDA) announced two items particularly relevant to retina specialists: the approval of adalimumab (Humira, AbbVie) for noninfectious intermediate, posterior, and panuveitis treatment, and a revision to the prescribing information for aflibercept (Eylea, Regeneron). The FDA announced that adalimumab has been approved for noninfectious intermediate, posterior, and panuveitis. The announcement marks the first time the regulatory body has approved a noncorticosteriod therapy for those indications. It is the 10th approved indication for the drug in the United States for immune-mediated diseases. sparing treatment, or in patients for whom corticosteroid treatment is inappropriate. In 2014, the FDA granted adalimumab orphan drug designation for the treatment of certain forms of uveitis, which permitted 7 years of market exclusivity for the treatment of noninfectious intermediate, posterior, and panuveitis in adult patients. The agency also announced that it has approved an update to language in the dosage and administration section of the label for aflibercept. The language change applies to patients being treated for neovascular age-related macular degeneration (AMD), diabetic macular edema (DME), and diabetic retinopathy (DR) in patients with DME, and clarifies that some patients may continue to require monthly injections after initial monthly loading doses. The Plex Elite 9000 (Carl Zeiss Meditec), a swept-source optical coherence tomography (OCT) imaging platform, has received marketing approval in Europe, according to a press release. The device allows clinical researchers to image ocular structures at any depth of interest—for example, vitreous, retina, or choroid—and provides OCT and OCT angiography capabilities. The FDA has not cleared the device for marketing. The study followed 30 patients across 10 centers in the United States and Europe. Patients were diagnosed with RP and had bare or no light perception. The worse-seeing eye of patients was implanted with the Argus II. At 5 years, 24 patients remained implanted with the device. There were two instances of device failure (both devices remained safely implanted in the patient), and three explanted devices. One patient died during the study. The rate of SAEs fell after 3 years of implantation. At year 3, there were 23 SAEs; at year 5, there were 24. The only SAE to occur between years 3 and 5 was a rhegmatogenous retinal detachment, which was treated successfully and resolved. At year 5, there were four instances each of conjunctival erosion, hypotony, conjunctival dehiscence, and presumed endophthalmitis; these were the most common SAEs. 1. da Cruz L, Dorn JD, Humayun MS, et al; the Argus II Study Group. Five-year safety and performance results from the Argus II Retinal Prosthesis System clinical trial [published online ahead of print July 21, 2016]. Ophthalmology. The ACCORD study (2003-2009) randomized patients with type 2 diabetes to intensive or standard treatment for glycemia, systolic blood pressure, and dyslipidemia. Study participants (N = 1310) were reexamined in the ACCORD Follow-On (ACCORDION) study 4 years after the ACCORD trial closeout. The outcome measure was DR progression of three or more steps on the ETDRS scale. In the treatment arm assigned to intensive glycemic control (A1C level < 6.0%), 5.8% of patients experienced DR progression. In the treatment arm assigned to standard glycemic control (7.0% to 7.9%), 12.7% of patients experienced DR progression (P < .001). Researchers noticed no statistical differences among patients assigned to intensive or standard blood pressure treatment, or patients assigned to dyslipidemia medication or placebo. 1. Action to Control Cardiovascular Risk in Diabetes Follow-On (ACCORDION) Eye Study Group. Persistent effects of intensive glycemic control on retinopathy in type 2 diabetes in the Action to Control Cardiovascular Risk in Diabetes (ACCORD) Follow-On study. Diabetes Care. 2016;39(7):1089-1100. Researchers performed a pooled, retrospective, post hoc analysis of data from the phase 3 RISE and RIDE trials and subsequent OLE trial. A total of 500 patients enrolled in the OLE trial after completion of the 36-month RISE and RIDE trials. During the RISE and RIDE trials, patients were randomized to sham injection, 0.3 mg ranibizumab, or 0.5 mg ranibizumab. In the OLE trial, all patients were eligible to receive as-needed 0.5 mg ranibizumab according to predefined retreatment criteria. annual injections, and 88 required > 7 annual injections. Patients who received less than seven annual injections during the OLE trial had a shorter average duration of diabetes and DME at baseline, were less likely to have proliferative DR at baseline, and were more likely to experience DR severity scale improvement of at least 2 steps. 1. Wykoff CC, Elman MJ, Regillo CD, et al. Predictors of diabetic macular edema treatment frequency with ranibizumab during the open-label extension of the RIDE and RISE trials [published online ahead of print May 18, 2016]. Ophthalmology. 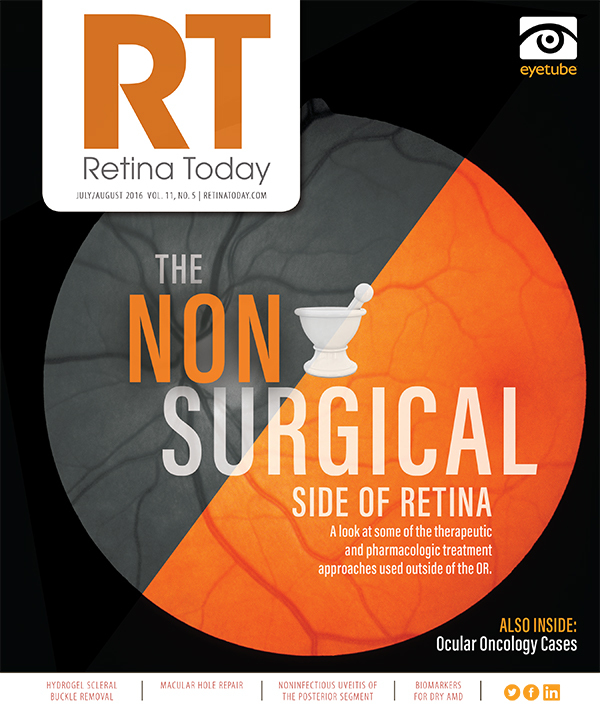 In January 2017, the American Academy of Ophthalmology (AAO) will launch Ophthalmology Retina, a new scientific journal focused exclusively on retina-related eye diseases and conditions, according to a press release. Andrew P. Schachat, MD, will serve as editor-in-chief for the journal; he was previously editor-in-chief of the AAO’s journal Ophthalmology from 2003 to 2012, at which time he became a senior editor for the journal. Ophthalmology Retina, like Ophthalmology, will be published by Elsevier. The European Commission (EC) has granted an orphan medicinal product designation to an investigational gene therapy product candidate from AGTC for the treatment of X-linked retinitis pigmentosa caused by mutations in the RPGR gene, according to a press release. The EC and FDA had previously awarded the product candidate orphan status for X-linked retinoschisis and for the treatment of achromatopsia caused by mutations in the CNGA3 and CNGB3 genes. A cross-sectional study examined data from patients aged 18 years and older participating in the National Health and Nutrition Examination Survey and patients aged 18 years and older seen in clinics participating in the AAO’s Intelligent Research in Sight (IRIS) Registry. Researchers calculated the estimated diopter-adjusted prevalence of HM at 3.92%. They calculated the PHM rate at 0.33% and the mCNV rate at 0.017%. These rates translated into population burdens of approximately 9.6 million adults with HM, 817 000 adults with PHM, and 41 000 adults with mCNV. 1. Willis JR, Vitale S, Morse L, et al. The prevalence of myopic choroidal neovascularization in the United States: Analysis of the IRIS Data Registry and NHANES [published online ahead of print June 7, 2016]. Ophthalmology.